BrandHK has many years experience in supplying AFL kit and a great reputation for supplying high performance custom printed guernseys and bespoke design sports shorts to teams across Asia from Singapore to Shanghai. Fast delivery, individual names and numbers and flexibility with repeat orders make our service package unique in the region. Choose light weight fabrics for tropical playing conditions or heavier weights for the cooler regions. Double stitching on the joins and quality polyester fabrics come as standard as does vivid all over print. Match your shorts to your jerseys and specify your own sock designs. Low minimum orders and a 4 week making time make this an unbeatable proposition. Talk to our sales staff about your specific requirements. To access prices, email newsletters and order our catalogue, please register by completing the form below. We will not share your information with any other parties. Good news – you now have more payment choices at BrandHK. In addition to direct bank payments, cash, cheque, Visa or Mastercard we now accept American Express, UnionPay, JCB cards and P cards. BrandHK has linked up with Paypal for credit card payments. This gives you a greater choice of cards to use including American Express. It also improves security as you can make the payment from the security of your own desk and your own computer. In addition, we can now accept P-cards or Purchasing Cards so if you are working in a Government Department it makes buying promotional goods from Brand HK even easier! So now you can choose how you want to pay. All completely secure, giving you peace of mind. Our online catalogue has printing and pricing options on most products and we try to make it as clear as possible. Make sure you check out our range of packaging and gift boxes to really set your promotional gift off in the best light. Let us know which products you are interested in and we will confirm the price, stock availability and delivery times for you. Our highly trained Sales Team will guide you through preparing artwork for printing and personalization, and can give you a suggestions for making the most out of your budget. When you are ready to order we will send you a digital mock up to approve. Once you are happy with this we will require a 50% deposit in order to start work on your items. Many of our goods are printed by ourselves in our own factory in Hong Kong. This means we can personally check all items for quality before they are delivered to you. Deliveries are made to your door by van, local courier or UPS depending on your location. Please advise the item, the quantity and the number of colors you want printed. For USBs please also advise the memory size. For T-shirts and Polo shirts please advise the number of places on the shirt that you want your design to be placed. 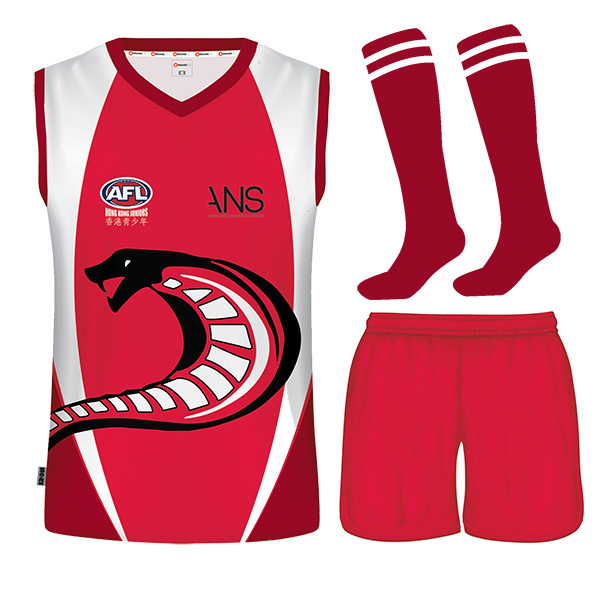 BrandHK has many years experience in supplying AFL kit and a great reputation for supplying high performance custom printed guernseys and bespoke design sports shorts to teams across Asia from Singapore to Shanghai.